There is nothing too exciting about the ice-run so far . The weather is cool so the water remains low . The ice is thin so as the water backs up a little it does not take much for it to wear through , as seen in this picture at Big Murphy Pool . The main channel is open on most sections of the river so with a little rain and warm weather the river should be clear well in advance of opening day . But , the weather forecast for the next two days is for snow flurries and cold temps below normal at -16c. Rain coming early next week though . The Walter Murphy Front, which consists of app. 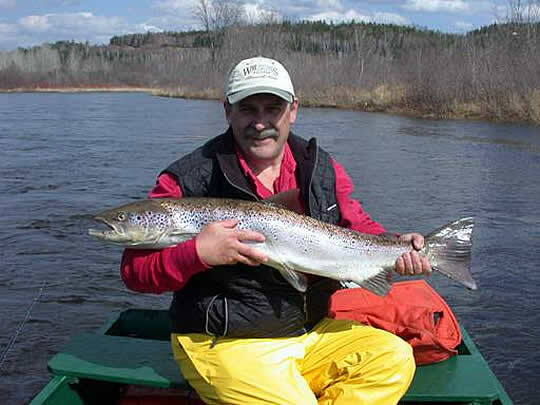 2,000 feet of frontage, is worked best during the spring salmon angling season when it is a good producer. Walter Murphy Front is also fishable by one to two rods in the summer and fall. 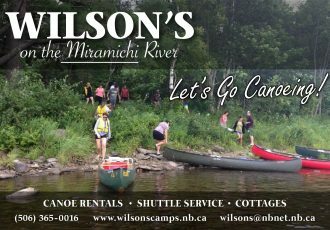 Wilson ‘s has ownership of the entire pool which is on one side of the river.